What are the Best Inflatable Water Slides for Home use? The Most Fun Inflatable Water Slides for Sale! Are you looking for the most fun inflatable water slides to put in your backyard for your kids this summer? You are on the right ‘inflatable’ page then! Here you are going to find some of the cutest and most colorful inflatable water slides for sale around! Why pay hundreds of dollars for just a few hours of water sliding fun when you can have your very own water slide? *This is one the cutest inflatable water slides around! It’s an inflatable shark water slide!! Will look amazing on your backyard! Great summer gift idea for your kids! First of all it is affordable! It is also very safe, very durable and believe it or not, it only takes about 15 minutes to set it up! It fits multiple kids playing at the same time, which is a huge plus, specially when throwing a birthday party! Definitely one of the most fun inflatable water slides for sale from this page! Most inflatable water slides from here are very easy to set up, come with their own blower and will keep your kids busy for hours on end during summer! I think they are the best summer ‘toys’ for children! Just imagine throwing a cool and wet birthday party for your kids? What better way for them to do just that than with a fun water slide? But which ones are the best ones for a backyard? Well, that depends on the size of your backyard, of course, and how much you can spend! There are all kinds of inflatable water slides for sale nowadays and all sizes! 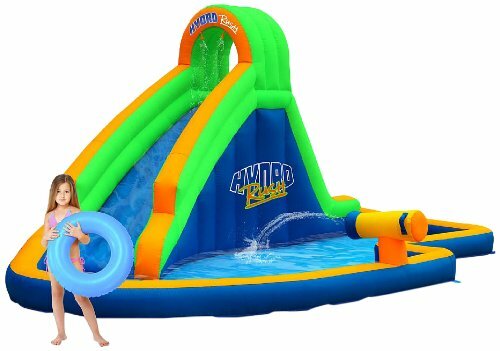 From gigantic ones, water park style, to cheaper and smaller ones, that are great for toddlers and small children up to 5 years old. 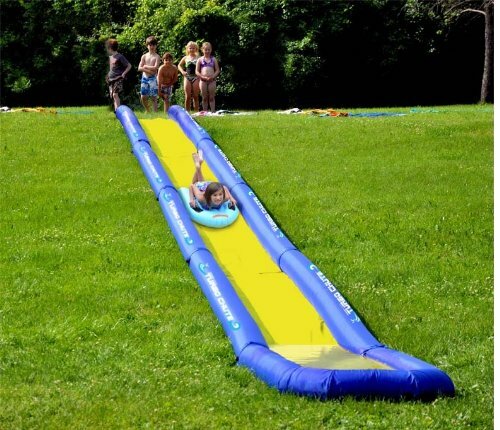 I gathered here a few of the best inflatable water slides for sale in 2014 based on how popular they are and how pleased the parents are for buying them. Awesome Inflatable Water Bouncer and Slide for Kids Ages 5 to 10! 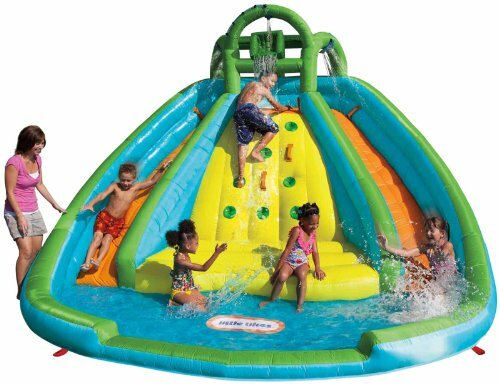 If you are looking for a large and affordable fun inflatable water bouncer and slide for sale that fits multiple children between the ages of 5 and 10 years old I think you are going to LOVE the Little Tikes Rocky Mountain River Race Bouncer! It is huge and FUN for everyone! Perfect for throwing the most awesome wet birthday parties ever! The cool climbing wall on the center is a challenge for the to climb! You will need to have a reasonable space in your backyard as this thing is gigantic! The air blowers are also included! If you’ve got the space and the spare money to get something like this, I say go for it! Summer time will never ever feel boring for your kids again! Fun Double Slide N Shoot Basketball Water Slide for the Backyard! Are you seeing double? You are supposed too! Great for families to enjoy the summer heat together! Perfect to celebrate summer birthdays! As you can see it is a double inflatable water slide with cool basketball hoops at the end! The kids have to climb, slide and shoot! All while wet from the water sprinklers! Ultra FUN Inflatable Turbo Chute Water Slide for the Backyard! 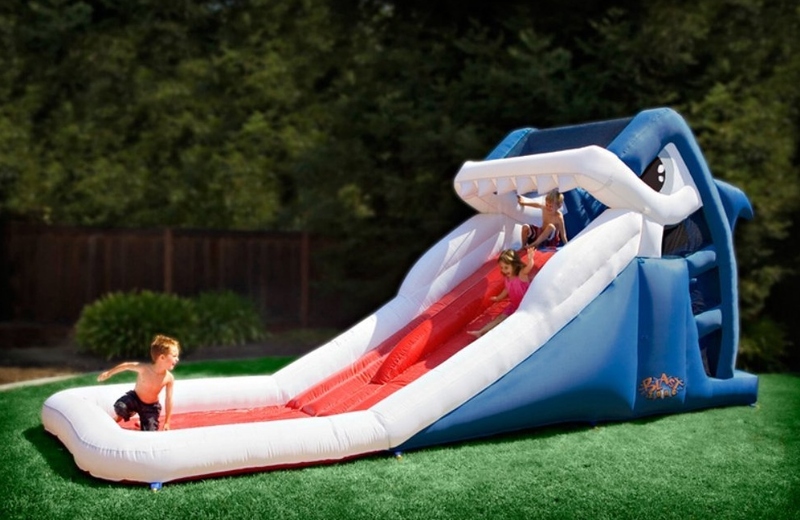 How fun is this inflatable turbo chute water slide for the backyard folks? Can you imagine having this in your home, for your kids? It’s almost like having your very own water park right from the comfort of your home! Best Affordable Inflatable Water Slide for Kids Ages 3 to 10 Years Old! 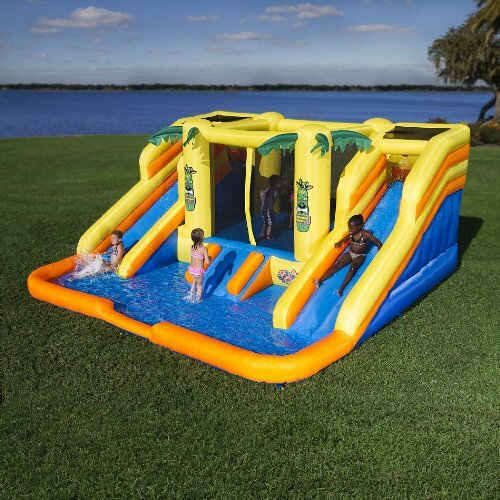 Blast Zone Hydro Rush Inflatable Water Park for the Backyard! 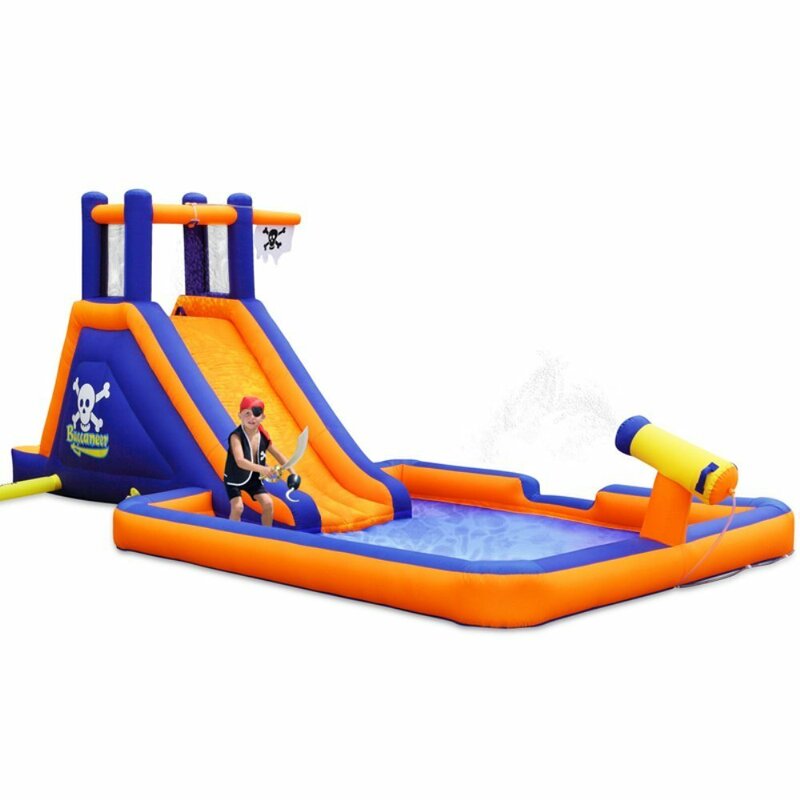 The Blast Zone inflatable water park is one of the most affordable and most popular inflatable water slides for kids ages 3 and up being bought by parents! It is very compact and great for a smaller backyard and it fits 6 kids playing at the same time! It’s very lightweight and super easy to set-up! Many parents said it was one of the best purchases for the summer! I cannot think of a better summer gift ideas for the grandchildren than this! Perfect for entertaining the little ones when you have a nice barbecue get-together with the family! *Let’s take a virtual tour of the Blast Zone Water Park! 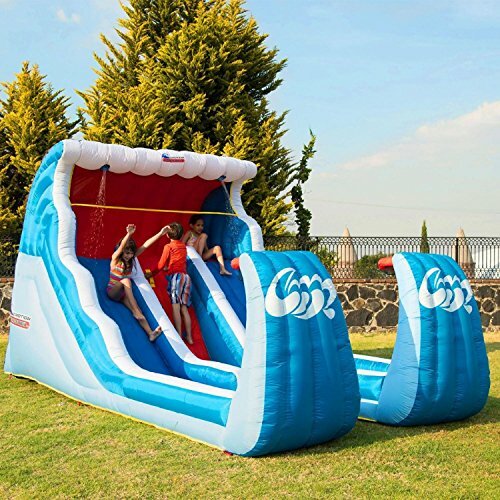 Best Inflatable Water Slides for Sale 2015! It is a crocodile inflatable water slide! 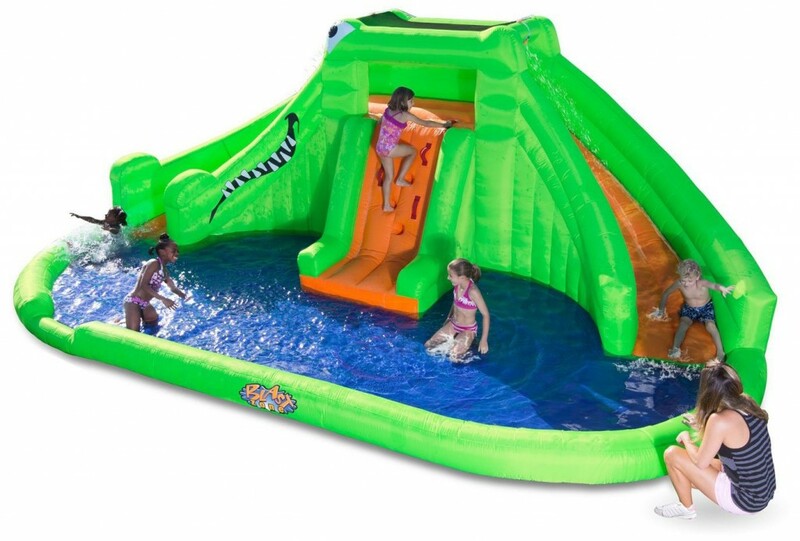 This Blast Zone Crocodile Isle is also another super popular and among the best reviewed inflatable water slides for home use by parents! Makes you want to be a kid again to enjoy this fabulous inflatable water park!! Your very own water park! It has two awesome water slides and a fun crocodile design! It’s safe enough for kids as young as 3 years old and fun enough for the older kids as well! Happy buyers said it is very easy to set up! Just unroll the giant green croc, hook the blower up, plug it in and watch it grow! Kids absolutely love the cool slides and the climbing wall! This cute and colorful hige inflatable CROCODILE water park slide for backyards will inflate in less than 3 minutes! Very easy and fast to set up! Guess how long it takes? Guess how many kids can play at the same time? They LOVE this fun crocodile ‘water park’! *Watch this amazing Crocodile Water Park in action! Blast Zone Shark Park: The Coolest Inflatable Water Park for Kids! This is by far one of the coolest and most fun inflatable water parks to have at home for the kids! 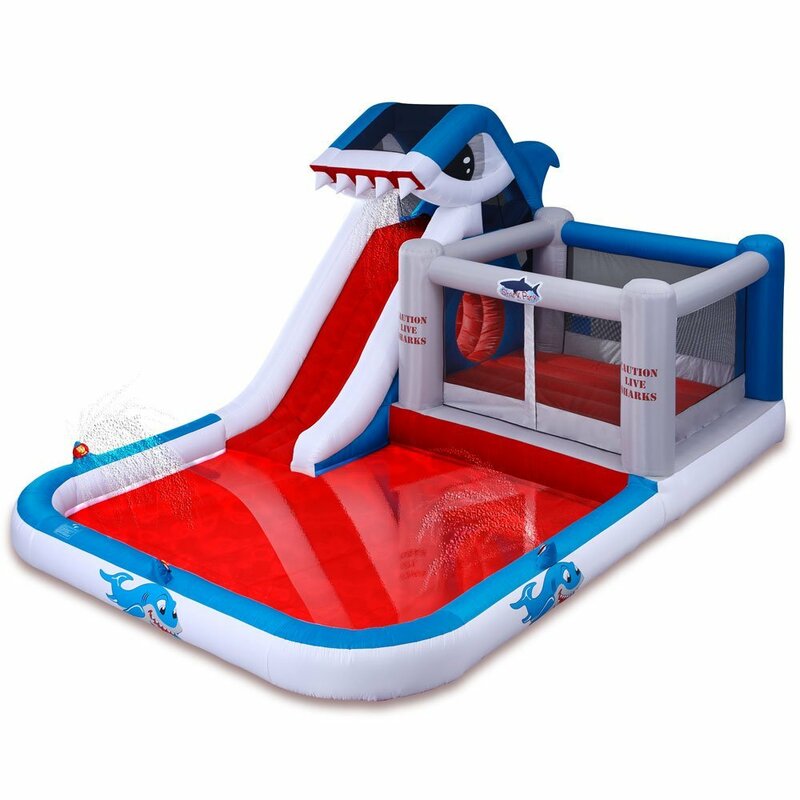 It is a cool shark theme inflatable water park with fun ‘shark sprayers’, crawl tunnel and a bouncer, not to mention the huge slide! The splash pool is also huge! Buyers said it is perfect for kids ages 3 and 4 up to 10 years old! *These kids are having a blast with their Shark Park! Inflatable Bounce House Water Slide Combo for Sale! Huge inflatable water park for sale! Now you can have your very own water park in your backyard! It’s a fun inflatable bounce house and water slide combo unit! Parents say it works for kids ages 4 to 8 years old and it’s absolutely perfect for hot summer days! It keeps them outdoors having a blast!! It is sturdy and pretty easy to set up! This is the perfect inflatable water park with bouncer and slides! 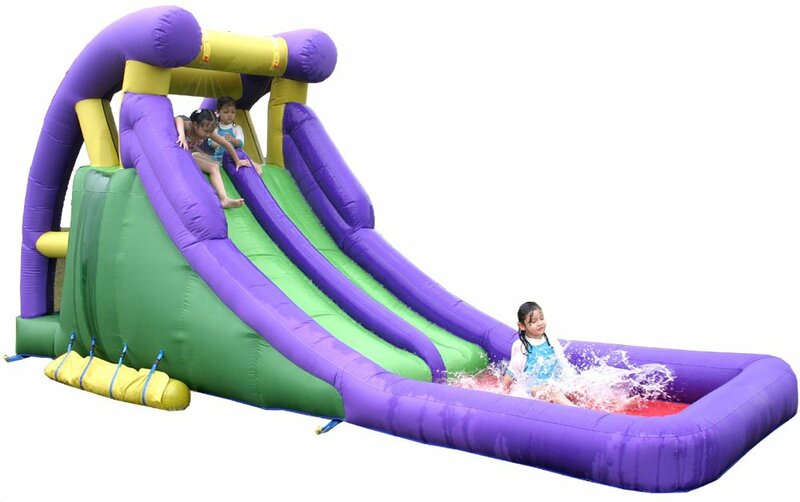 It fits 5 children bouncing and sliding in the water together! It’s also very fast to inflate, just unroll it, hook it up to the blower and in a couple of minutes you have a cool water park installed right in your backyard! It’s very sturdy as well and great for small kids and big kids! Blast Zone Buccaneer: Fun Pirate Theme Inflatable Water Water Slide for Boys! If you were looking for a fun and affordable inflatable water slide for your little boy this summer, then I think you are going to love the ‘Buccaneer’! It is a cool pirate themed inflatable water slide that also comes with a fun water cannon and a climbing wall! Perfect for little boys ages 3, 4 and up! Perfect to have the kids have a blast in the sun during summer! *Here is a little boy having the time of his life on the Buccaneer! Inflatable Double Water Slide with Splash Pool for Kids Ages 3 and Up! It is a double inflatable water slide! How’s that for a very wet and ultra-fun summer birthday party? Buyers said it fits children between the ages of 3 and about 10 years old! It includes the blower and it inflates in less than ONE minute! *I hope you enjoyed my selections of the best inflatable water slides for kids being sold here!